I wonder whether his assertion is based on his astute knowledge on finance or simply because he wants to be portrayed as the robin hood of Malaysia. When analysing the tax regime on the people; a regressive tax system means that the poor will pay more and the rich will pay less. It is no doubt in a pure GST regime that it is regressive. But slight modification has been made. More than 200 basic needs have been exempted from the GST. As the Robin Hood of Malaysia, DS Anwar should know these are the items that mostly consumed by lower and middle income group. Clearly, under the revised GST, the poor and middle income groups have been protected. Secondly, GST is a consumption tax. It is based on your spending. You spend more, you will be taxed more. Low and middle income earners are unlikely to spend more on non-basic items that are not GST-exempted. Even if they did, the volume is not as high as the wealthy people as their purchasing power is limited. It is usually the wealthy people who spend more on luxuries. The opposition leader should have known this since as a rich leader; he also likes to spend more on luxuries such as Omega watch, flying with private jet and numerous oversea trips. Thirdly, the net increment of the GST to the government’s coffer is only about RM3 billion per year. The rest of the money generated from GST will go to the people and also to offset the loss from reduced personal and company taxes. The cash handouts and all the 1Malaysia initiatives are intended to help the low and middle income groups. Again, these safety nets are meant to protect the low and middle income earners rather than the riches. How could this be regressive then? Next, the GST is not a regressive tax as it will make more people pay less income tax. It is announced those who earn less than RM4000 now will pay no income tax. This group as far as I know is not the wealthy people. The opposition under DS Anwar Ibrahim always like to criticise the government for being too reliance on Petronas’ money. They argued government’s revenue should be expanded because sooner or later the oil money will be decreasing. Well, isn’t what exactly the government is doing? To be less dependence on Petronas’ money is a progressive move. To stick with the status quo is actually a regressive act. So progressive GST is that it will ensure that errant business operators pay their dues. Has DS Anwar ever noticed that all the collection tax under the current SST may not actually end up in the government’s coffers? It is reported Malaysia has large capital outflows which usually happened from transfer pricing where companies transfer costs to various centres around the world to minimize the tax. In other words, government is financially bleeding. Once GST is implemented, it will make life harder for them to do so as they have to be complete record at every stage of transaction. Those who is evading taxes can also be traced. Isn’t that progressive? Lastly, GST has an inherent advantage. If a citizen consumes, he is taxed. If he does not and saves, the government can tap the savings for development purposes. Clearly, GST is not a regressive tax. Meanwhile, where is our self-proclaimed progressive Youth Leader to defend this progressive tax? Now we know how the United States of America has become a great country. It is something that never been taught in any leading business school. According to the Head of US Intelligence, knowing what foreign leaders were thinking was critical to US policy-making. Such critical the need of input from other countries that the National Security Agency (NSA) had led more than 61,000 hacking operations worldwide, bugged the EU offices, conducted an electronic eavesdropping operation on 35 world leaders and a total of 38 embassies were under surveillance. Malaysia included. Not content with foreign countries’ input, the NSA also was collecting telephone records of tens of millions Americans, tapped directly into the servers of Google, Microsoft, Facebook, Yahoo, etc and monitor up to 600 million communications every day. Ironically, all these things happened under the supervision of the country who lectures to the rest of the world about ‘rule of law’, ‘good governance’, ‘separation of power’, ‘democracy’ and ‘independence’. In fact they won’t hesitate to kill thousands of people just to ‘democratise’ them. Clearly this is the mother of all hypocrisy. To the self-anointed sheriff of the world, stop preaching about something you secretly against. We know for a fact people and nations spy, even on friends. And it must be done undemocratically as democracy is not the panacea for all political and security problems. Just admit it; the needs of the majority outweigh the right of individual. It has to depend on ‘undemocratic’ means to safeguard it from the freedom abuses. In case the USA wants some input on their policy, go away with the system where it takes USD20 million to be elected to the Senate; where lawmakers spend more time to raise money rather than studying issue. Please ensure the Congress not become a forum for legalized bribery or some drama that going to shut down the government again. Ignore the lobbyist and pass the most common sense gun law banning assault weapons after the mass murder of schoolchildren. This is our Tun Dr Mahathir- known simply as Dr M. From a poor African nation to a wealthy Arabian country, he commands a great respect. Such huge respect he had that Shah Rukh Khan- arguably one of the biggest superstar in the world- had flown directly from London with his private jet just to celebrate our beloved former prime minister’s birthday. It is an open secret that many of the developing countries cherish the idea of having Dr M as their leader. Locally, the recent poll suggested Dr M is the right man for the Prime Minister job. It is due to a simple fact that this man has turned Malaysia from an agriculture country to the 17th largest trading nation in the world by the time he retired. As a trained physician, he has generally been brisk, modern, quick to diagnose and even readier to prescribe. Because of these traits, Malaysia followed what Dr Mahathir calls the “Sinatra Principle” – they did it his way in dealing with East Asia Financial Crisis of 1997. Unlike Thailand, South Korea, Indonesia and the Philippines, Malaysia did not seek financial assistance from the International Monetary Fund. Dr M is never afraid to stamp his authorities. He is like Sir Alex Ferguson in politics; he believes for whatever decisions he has to made, unpopular or not, it is for the good of the country. In the same week in September 1998 that he fired his popular deputy, Dr M thumbed his nose at the global economy by instituting restrictive exchange controls on the Malaysian currency. He put the world on notice that unfettered capitalism may not be for every country. Dr M was called an idiot, an ignoramus and a pariah. Undeterred, Dr M wrote to the Time Magazine. The article ‘Call Me a Heretic’- I must say- is the sheer act of bravery to take on western savants and pundits who were almost unanimous in denouncing his measures. And 10 years later when the world plunged into financial crisis, Dr M has the last laugh. Few noticed Dr M as the evergreen writer. The writer in him continues to shine whether writing his own speech, an article or for his hugely popular blog. He is among a few politicians (or Prime Minister, maybe?) to make his stand known by writing his own thought. This is what makes Dr M different from his predecessors, contemporaries and nemesis. How many times our opposition leader pens his thought rather than simply reposting someone else’ opinion on his personal blog? The fact is very telling- Dr M is an intellectual without pretending to be one. Those who loathe him especially the intellectual (or rather pseudo-intellectual), to undermine him is the easiest way up. Maybe to demonise the Grand Old Man will make them smarter. How dandy is that thinking. If the detractors can’t argue with Dr M’s facts and figures, they will resort to question his origin. Ironically, these are the very same people who have self-styled themselves as meritocracy advocates and also the analysts that kept saying that race and colour are not important. Such racist people can be when desperate. Last 31st Oct 2013 commemorates the 10th anniversary of Dr M’s retirement as the Prime Minister of Malaysia. 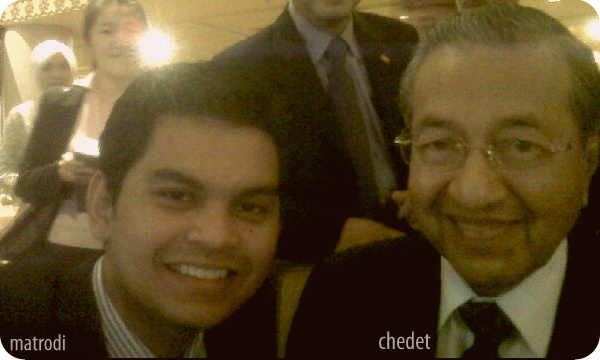 After 10 years, we miss Malaysia under Dr M’s leadership. But instead of remembering the good old days, we should have move forward. Recently, I went to Japan under the Look East Policy initiative. Never been to the land of rising sun, I was amazed how Japan can be so successful and developed country without having natural resources. How could that be? Later, I came to realize that the greatest resource that Japan ever had is the Japanese themselves. Since the near-total destruction of World War 2, Japanese have rebuilt their country through the hard work, passion and pride. Dr M- the longtime admirer of the Japanese culture always wanted Malaysian to emulate Japanese’s work hard culture. When he introduced Look East Policy thirty years ago, he believes this one single character contributes the most to the success of individuals, society or nation. They are not laid back. The success of the country is very much depended on the people; their values, their work ethics and their discipline when doing whatever they have to do. This is the essence of the Look East Policy. Fast forward today, the country is facing big political and economic challenges. Now more than ever our government needs us. We can’t hope to have another Dr M to make our Vision 2020 to be realized. To make this happen, it’s going to be up to us- the people. We should remember the government is a system of which the public is also a part. The Executives, you, me and all Malaysians. If the system is lacking in certain things, then to rectify the weaknesses is our responsibility as well. Remember, God only help those who help themselves. Even though the doctor is still in the house, (to quote Mr Shamsul Akmar’s article), Malaysians are responsible to keep the house in order.